Registration for 2019 camp sessions is OPEN! 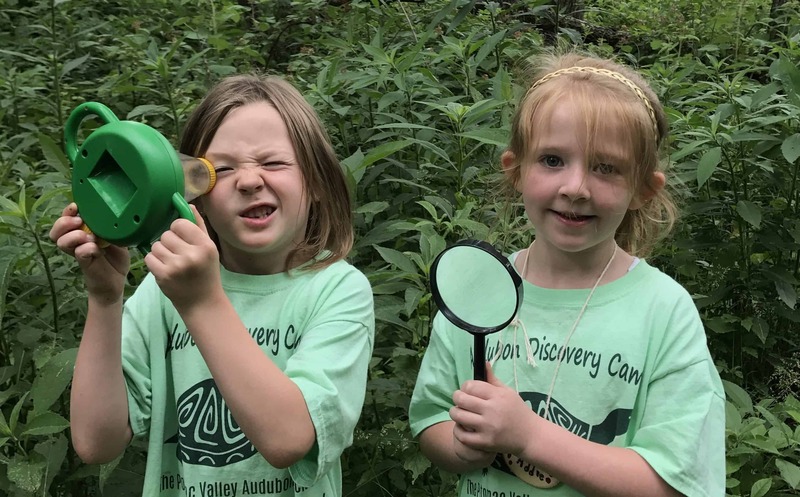 Explore Yankauer Nature Preserve and Cool Spring Preserve at our Audubon Discovery Camp. The camps focuses on natural and cultural history as kids explore forests and fields, build forts, turn over rocks and logs, play games, and generally have so much fun they don’t realize how much they’re learning. 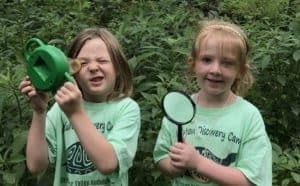 Our goal is for campers to gain a better understanding of their role in the natural world by using their senses and exploring with mind and body. If you are interested in camp, but feel that you need financial assistance, PVAS offers Camp Scholarships for families with financial need. Click here to learn more. Weekly camp sessions are held during the months of June and July from 9: 00 AM – 3:00 PM Monday through Friday. Groups are led by experienced staff and are limited to 8-10 campers of similar age to ensure safety and individual attention. Camp activities include hiking, games, crafts, and other activities that focus on the week’s theme. Click here for a calendar view of our camp sessions. WEE NATURALIST CAMP (Ages 3-5, accompanied by a parent/guardian) Explore the natural world with your child! We’ll keep you moving with a variety of activities including circle time, short hikes, nature crafts, hands-on nature exploration, stories and imaginative play. Every day covers a different nature theme! Get inspired by nature to create artistic masterpieces! We’ll collect our own natural clay to create sculptures, make leaf hammered bandanas, and create nature weavings! We’ll also dabble in nature journaling and create murals out of recycled materials! On Friday, parents are invited to see the campers’ final creations at an art exposition! Get ready to get wet because this week is all about water! We’ll search for creek critters in Bullskin Run, build and race mini-rafts, build waterproof forts and learn to purify water in nature. With Cool Spring Preserve as our home base, each day is a different adventure! We’ll practice archery and survival skills, and explore the creek at Cool Spring Preserve. We also spend a day canoeing on the Shenandoah River. On Thursday night, we’ll camp out at the preserve! More information here. Attend a training to learn about leadership, techniques for engaging and working with children, and how to assist with camp games and activities. Then, work as a junior staff member for one or two weeks of camp that you will select when you register. Learn how to take the BEST digital photos whether you are new to photography or already know the basics. For most of the week, you’ll be outside taking pictures using a Nikon 35mm digital SLR camera that is provided for camp use, but time will also be spent indoors editing your photos. On Friday, enjoy a public display of camp participant photos. Considering an environmental science career? At this camp you’ll explore different career path options with professionals in the field. Learn how to survey bird populations, assist in stream data collection such as electro fishing, water quality testing and macro invertebrate sampling. Learn basic insect identification with an entomologist and conduct a forest survey. Work with a naturalist to try environmental education and interpretation. You’ll leave this camp feeling inspired and involved in the many environmental career opportunities that you can pursue! Interested in working as a summer camp counselor? Hats and sunglasses are recommended. Cell phones, iPods, MP3 players, electronics/electronic games, card games, or anything valuable that you do not want to risk being lost or damaged. If you must cancel this registration, please let us know as soon as possible so that we can offer your spot to another family. For all cancelations, the $50 registration fee is non-refundable. In addition, for cancelations made less than two weeks before the start of a camp session, no amount of the payment will be refunded.